Could be buffed to give +3 health or +1/+1 to your totems and even then wouldn't see play. One of the worst cards in the game. Horrendeous card with amazing art. 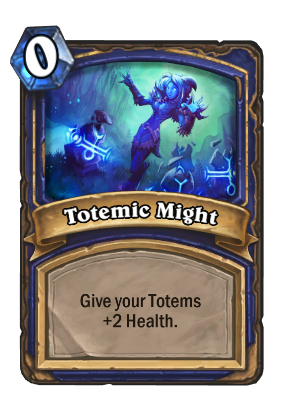 Synergizes well with Wicked Witchdoctor; summoning her on turn 4 and then immediately getting a free totem while also buffing your existing ones can give you a solid board early on. I both love and hate that this card is now viable thanks to the new Totems. A gift from Spellslinger, Nexus-Champion Saraad, Nefarian, Burgle and Yogg-Saron, Hope's End. Thanks a lot. Your board of Hero Power totems no longer gets wrecked by most board clears. Your opponent will have to be more creative to clean up after your Thunder Bluff Valiant, and if your SMOrc opponent thought that Explosive Trap would save them, they'll be crying - especially if you have a Healing Totem. If you have a Searing Totem and a Healing Totem, all of a sudden the Searing Totem cannot be killed by hero powers. If you have a Healing Totem and a Stoneclaw Totem and no Totemic Might, the Druid and Rogue hero powers are useless to begin with. With Totemic Might thrown in, you have a 4 health taunt that more or less needs to be killed in one turn. It also cost you 2 mana and a fraction of a card, which is incredibly awkward to deal with efficiently. Totem Golem now trades with Piloted Shredder and lives. Enough said. Why are you visiting this page. Because this card is getting buffed in the next expac. About as useless as it gets; even at 0 mana, it's overcosted since it uses a card. Best waifu. Honestly though can be very useful in certain matchups such as warrior where they will have a hard time removing all of them, and then adding this can ensure they stay alive if you are waiting for a bloodlust to pop in.